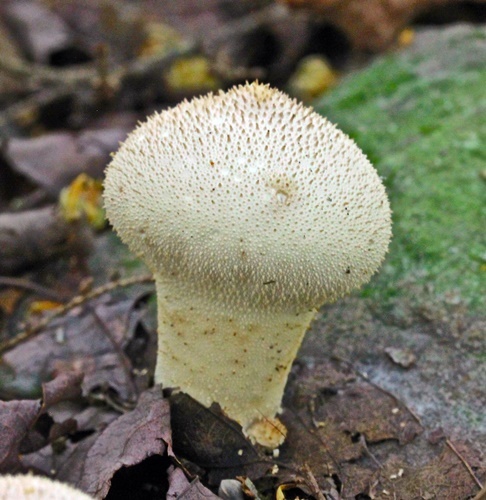 fruiting body is up to 6 cm broad, pear-shaped, white to dull white, with small conical spines that break off but leave a network of spots behind. flesh must be undifferentiated with no trace of gills, no thick rind and no outline of mushroom visible in cross section. appears in the summer and fall. taste is mild, no odor; cook before eating. grows singly, in groups or clumped together on forest beds under conifers and hardwoods. warning: do not confuse with young, white, button-stage mushrooms, some of which can be deadly poisonous. Button-stage mushrooms differ in that they exhibit faint differentiation when cut in half, rather than being solid white.